The ASW Elementary School uses the Math Investigations program for the foundation of our mathematics curriculum. Investigations is a program created by a large team of educational professionals, and it is grounded in more than 20 years of research and classroom trials. One of the benefits of the exploratory method employed by Math Investigations is that it encourages the students to think through the reasons behind the answers to their problems. For example, if a child knows that 5 + 3 = 8, Math Investigations will ask, "How do you know?" Or, "How could you prove that fact to someone who did not believe you?" Children might prove their answer with a drawing, with a representation with linking cubes, or by demonstrating the sum on a number line. There are many ways for the children to show their thinking. 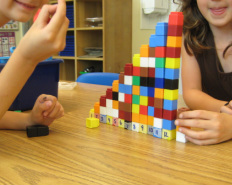 In this manner, the children stretch beyond mere memorization of math facts and work toward a full internalization of mathematics concepts. In Math Investigations, we use manipulatives (please see the VoiceThread video below) and life experiences to give context to our work. Please look for parent information letters that will explain the concepts of each unit in detail at the beginning of the unit. Periodically, I will send copies of a game for you to play at home together with your child. These games are a fun way to reinforce the concepts learned at school. On a personal note, I realize that the Math Investigations approach can be off-putting to those of us who learned math in the way that was common some years ago. More than once, I have had to set aside my standard approach to math problem solving in order to interpret and understand my sons' homework. I want you to know that I am also learning along with you. If you are ever concerned or confused about our mathematics lessons, please send me a note. I would be more than happy to discuss our work with you. Parents who would like to learn more about the Investigations program might want to visit their website: http://investigations.terc.edu/index.cfm.